Radlett plantation shutters from your local shutter experts! Just Shutters offer you the finest range of beautiful, bespoke shutters. Over a decade of experience and unsurpassed reputation. Our shutters come with a lifetime guarantee for your peace of mind. Call your local shutter expert Tom Parrott now for information, a free brochure or to arrange your appointment: 01727 221298. 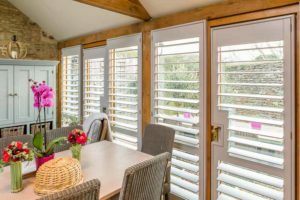 -Style – our quality and range is second-to-none, please browse our shutter images or request a brochure for inspiration. Just Shutters are a dedicated Plantation Shutter company that have been operating since 2006. Since then we have earned an unrivalled reputation as the shutter specialists. We have the largest range of quality shutters available and offer value and service that is quite simply unsurpassed. We would be delighted to show you what we can do for your home, simply contact us on 01727 221298 and get in touch with our local specialist Tom. Installation of plantation shutters to 3 rooms. Installation of shutters to two bay windows and two side windows.